This week I intended to explore the life of the founder of Peak Oil. And then talk with the world’s greatest expert on coral and dying coral. But climate change is disruptive, creating events none of us expected. Recently even higher record heat struck the lands known for record heat. The heat wave in both India and Pakistan is deadly, and hardly reported by Western media. Indian heat wave coverage by Robert Scribbler’s blog, the hottest ever recorded in India. That was in the city of Phalodi, in the desert state of Rajasthan, Northwest India. 52 degrees C was expected in Larkana, Pakistan. In this part of the world, as in Australia, heat already kills more people than any other natural hazard. The greatest mass death event in Europe this century was the 2003 heat wave. This is the second year of extreme heat in southeast Asia. As we’ll hear from two scientific guests, all this was predicted by recent studies. The same studies say it will get even hotter, for longer periods, as the decades progress. Already, the heat is breeding despair, suicide, violence, refugees, poverty and hunger for hundreds of millions of people. It can also become a “hot-bed” for terrorism. Two points from our coming guests: the poorest victims of this heat are the least responsible for global warming. The source of the pollution has been half a world away, where most of us live in fossil-powered luxury. But in a world connected by finance, trade, and airplanes, the blowback can travel back from half a world – from the steaming countries of India and Pakistan. Second, we used to believe that some climate catastrophe will finally drive the world to change. Now we know, each stage of tragedy becomes the new routine, the new normal, and stops being reported. We talk with Dr. Michael Wehner, who co-authored the report on extreme weather for the Intergovernmental Panel on Climate Change. He’s got new research awaiting publication on the heat waves of India and Pakistan. I’ll be sharing an email exchange with Indian scientist M. Rajeevan. He’s published research on the increasing frequency and severity of heat waves in India. Dr Rajeevan now heads the climate and meteorology services for the Government of India. But first, I engage with Adil Najam, one of Pakistan’s leading intellectuals about the realities of punishing heat waves in a vacuum of public policy, as his country struggles to survive our pollution. I’m Alex Smith. This week on Radio Ecoshock, the news and science you need to hear about the hot new future. Listen to this Radio Ecoshock show on Soundcloud right now! The crushing heat in this year of 2016 is not the first to strike Pakistan and India. Just last year, thousands died and Pakistan suffered a kind of heat paralysis. What happened then and now? Our guest is the Dean of the Pardee School of Global Studies, at Boston University. He’s a Professor of International Relations concerning earth and the environment. 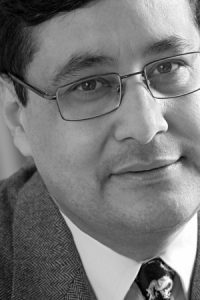 And Dr. Adil Najam Wiki was a Vice Chancellor at Lahore University of Management Sciences, in Pakistan. Adil Najam turned out to be a great guest. We seldom hear what is happening in Pakistan, and that matters for a lot of reasons. With Nadam, we have a leading academic, who also for a time hosted a public affairs program on the Pakistan TV system. He’s an experienced communicator. Dr. Najam doesn’t shy away from climate change. Adil knows it’s huge, and the impacts on Pakistan alone could be a shower of extreme events, each harder to recover from as the years pass. There could be a cycle of drought in some parts of the country, and, as this year, concurrent floods in another region. That could be punctuated by unbearable heat waves, extreme rainfall events, and violent storms. It’s the future of the majority of the world’s people. We begin with the terrible heat wave that killed at least a thousand people in the major Pakistani port city of Karachi in 2015. Karachi’s population is unknown as the government has not done a census in a long time. The official figure is ten million people there, but that comes from 1998. Adil Najam guesses the figure might be 15 million. The World Population Review estimates the number of people in the Karachi metropolitan area at an astounding 24 million! It’s a mega-city for sure. As we learn from our next interview with Michael Lehner, TWO major heat waves hit the Indian sub-continent in 2015. The first was very hot and dry, hitting the desert regions of northwest India the hardest, but also affecting parts of Pakistan. About a month later, a second heat wave came up from the Indian Ocean. It was hot and humid – the worst and most deadly combination for human health. When we can’t sweat, we die in the open air. Adil Najam adds a cultural twist not generally covered in science. That wet heat wave hit Karachi during the Muslim fast month of Ramadan. Some people were already slightly weakened by the fasting, and so more prone to heat illness and death. The hospitals were overwhelmed. People laid outside and passed away. The morgues overflowed. There was no room at the cemetaries to bury the dead. Much of this was preventable, says Adil Najam. In fact, as he points out, all of it was preventable, if people in Western nations had curtailed carbon dioxide pollution a couple of decades ago, when we were first warned of the danger. Beyond that, the government did not warn the citizens of how serious this heat wave would be. Forecast can be improved, although it’s getting better. Third, the government could institute cooling stations, as other countries have done. The very poor, and the many homeless, could have flocked to public spray stations, with plenty of drinking water available as well. Hydration helps. Plus Karachi needs more trees, to provide shade. Shade can save lives. We learn that the majority of people in Pakistan cannot afford a fan, or find the electricity to run it during the heat waves. The Middle class and the wealthy buy air-conditioners, and probably generators to run them. So heat death is also a class problem. I would just point out that when the inventory of refugees flooding into Europe is taken, especially through Turkey, there were a large number of people from Pakistan. Some of course are economic refugees, hoping for a better life in Europe. Others are climate refugees, finding their crops burned out, and their country at times to hot to live in. It’s just the beginning of all that. My guest Michael Wehner turned out to be an expert’s expert. He’s been a lead author in a special report from the IPCC into extreme weather. He’s a staff scientist at the Lawrence Berkeley National Laboratory. I think he’s a powerful figure. As first he was very cautious, sticking only to the careful adherence to what can be proven, or at least published with peer review. But then, like so many scientists, he uses that credibility to speak even more strongly about the extreme risks developing with less than one degree of warming since the industrial revolution. For example, in our interview I called the IPCC 8.5 RCP (Representative Concentration Pathways) the worst case scenario, which we are currently heading straight for with current emissions. Wehner corrected me. That’s just the worst case that the United Nations backed Intergovernmental Panel on Climate Change would consider. There are much worse scenarios. If you listen closely, he describes some of the global weather disruptions, with grim local consequences. We are talking about a different planet than the one you grew up on. As Dr. Wehner points out, that is based on the worst-case scenario of fossil fuel burning, assumed in 2005 for the IPCC. In fact, we’ve already surpassed those levels of greenhouse gas pollution. Nobody has studied the real worst case scenario now unfolding, although the new paper led by James Hansen moves in that direction. I’ve covered that paper in my previous two Radio Ecoshock shows. To complete this Radio Ecoshock feature on the heat emergencies in India and Pakistan, I wanted to get you a more official position directly from India. I found exactly the right person. While working for Indian Institute of Tropical Meteorology, Dr. Dr M. Rajeevan just published on May 19, 2016 a paper in the journal Nature . The title is “On the Variability and Increasing Trends of Heat Waves over India”. Already, Dr. Rajeevan has moved to become the Secretary to the Government of India in the Ministry of Earth Sciences. This is a very high ranking post in the Indian government. He is in charge of weather forecasts and monsoon prediction, among other things. Dr. Rajeevan was moving too fast for an interview – but did agree to answer my email questions (which essentially was the interview I planned). I read those out on the show. The scientific paper by M. Rajeevanby M. Rajeevan and his co-authors finds that for each decade studied, in India one more extra extreme heat event happened. Each decade, the heat wave lasts two days longer than the previous decade. Those two extra days can be the most deadly, for people, animals and crops. “Our findings are: heat wave frequency, duration and maximum length of heat wave events are increasing over the country, especially over central and northwest India. Total duration of heat waves has shown an increase of 1.3 days per decade and maximum duration, 0.76 days per decade. Then we also analyzed major climate forcings that act on the variability of heat waves. We find that both the equatorial Pacific Ocean (El Nino events) and the equatorial Indian Ocean are responsible for the variability and trends of heat waves over India. Their study also shows these heat waves will only get more frequent and stronger as we move through this century. Greater tragedies and more suffering are already dealt in the carbon card game. We know from other science, that’s not just for India. This is the future for Paris, for Moscow, for the American South, for the Arctic, for Brazil, Africa, everywhere. As we’ve heard, this unbearable heat is accompanied by drought. Tens of thousands of farmers have fled their burned-out fields to live in city shanty towns. Reuters reports hundreds of farmers have killed themselves instead. With water shortages, come the usual killer diseases. Nobody knows how many have died from this heat emergency in India or Pakistan. The grave diggers of Karachi Pakistan as taking no chances. They have prepared an extra large trench for mass burials. But who are the grave diggers of Karachi? We are. So why don’t those Indian or Pakistani people just stay home, turn on the fan, or go down in the cooler basement? Many don’t have a home, much less a basement. Millions, likely hundreds of millions, cannot afford a fan, or find the electricity to run one. And if you don’t go to work hot, hot day in the fields, your family doesn’t get any food either. Those who can leave will leave. They will come to where it is cooler, to places where there are fans and electricity. They will come however they can. Others will, as Adil Najam says, make irrational choices, and decide to kill the affluent people they perceive to be killing them. It’s all connected now, in nature, and in the human economy. What happens on the other side of the world matters. I’m Alex Smith. Thank you for joining us this week, on Radio Ecoshock. As we leave, I’d like to play you my small tribute to another strong voice who left us last week. Michael Mariotte headed the Nuclear Information and Research Service, NIRS, in Washington DC since 1985. He helped turn the tide away from the madness of nuclear power. The right wing and corporate media create great portraits of their wealthy heros. The left too often fails to remember the activists who gave up wealth to fight for a better world. You can download or share this tribute song from my blog at ecoshock.info, or from the Radio Ecoshock soundcloud page. Here you go Michael. Here’s my song for you. We’re part way along fixing the system, actually, having to create a system for 3 separate podcast streams. Apparently, there isn’t a Word Press app for that, so my guy Carl is developing the code for it. When he’s got that working, then I can resubmit to Itunes, and start rebuilding my podcast listener base. The podcast listeners, and not those from non-profit radio stations, donate enough to keep the show at least paying for itself. That could be you! Please head to How to help Radio Ecoshock on the Radio Ecoshock web site to see how you can help keep this program going. That aside, there is always the possibility that some of the 94 non-profit radio stations broadcasting this progrm could go bust. Media is always changing. If I have a listening audience via podcast by then, Radio Ecoshock could carry on. Of course, the really special part of podcast listeners is they say “yes, I like this enough to get it every week, I don’t want to miss a show”. Those are the super listeners. The relatively small feedback I get from podcast subscribers suggest (a) many listen when moving, whether driving or walking somewhere (b) many are communicators themselves in fields, including a few journalists, and a bunch of science undergrads and postgrads. They too want to hear what some of the world’s best climate scientists have to say. Scientist Paul Beckwith says he listens to every show, as he walks to or from the University. You had a “Search” function on your older platform, I was planning to search for David Wasdell. Did you ever have him on your show? I’m not a climate scientist (lol) but he seems to make a hell of a lot of sense. Take care and keep fighting! I have had David Wasdell on Radio Ecoshock. In fact, he was one of my most popular guests of 2015. Here’s the blog for that program, with links to listen or download it. You and brave hardy few at 6 am in Melbourne, on 3CR radio. How about dropping them an email requesting they move the show to a better time! It just seems so important for all of Australia.